Messaging isn’t about text. It’s about conversations. Here’s why the simplest apps on your phone are quickly becoming the most powerful. There’s arguably more innovation happening in messaging today than any other mainstream category of software. Yes, typing on your phone is a lousy proposition: a tiny keyboard trapped behind a pane of glass and hidden underneath your thumbs. But we still do it. We message all day long, in bursts and binges. We message family, friends, colleagues. Increasingly, we message more than anything else we do on our phones. Despite its shortcomings as an input mechanism, typing on a touchscreen has succeeded for many of the same reasons that mobile itself has succeeded. Both parties don’t need to be available at the same time, unlike with phone or video chat. Yet conversations tend to move along at a decent clip, unlike they do over email. Messaging provides some buffer time that I suspect can actually improve the quality of a conversation; people have time to formulate a good response (or a good joke) without immediate pressure or fear of l’esprit d’escalier. Most messages can be quickly read from a lock screen notification (or from a watch!) and immediately understood. They’re short. You don’t have to set time aside to plough through them. They don’t feel like a burden. This may seem obvious, but anyone who has put off listening to voicemail or marked an email as unread understands the value of this. There’s no need for boilerplate salutations, lengthy intros, or signatures. Messaging is snappy. Tap it out, done. The awkwardness and inherent limitations of typing on a phone may have even contributed to this advantage: nobody’s going to think you’re rude for not tapping out the novel-length version. This became clear to me the first time I used Intercom to chat with a business: the breezy dynamic of the medium changes the tone to be far less formal. This is also why we’re willing to take 100% of our photos with a camera the size of a lentil, and play games or read books on a screen the size of a playing card. Convenience always trumps power when it comes to communicating. An emoji can actually say a lot. A read message that goes unreplied can say more. Communication is a fundamentally human act, and anything that allows us to connect with each other is going to connect with us. Messaging can emulate the intimacy of a private conversation or the fun of group banter. So if sending messages is already so great, why does it need to change? Let’s look back down the communication stack. Writing is the main technology we use to pass information back and forth so that it persists for a long time. You could even say that language itself is a technology that allows us to transfer ideas from one person to another (albeit in a somewhat lossy format). Language, drawing, writing, printing, television and nearly every other communication technology; they all emerged or were collectively invented to solve the problem of the previous method of communication not being fast enough, or robust enough, or of sufficient fidelity. As enjoyable as it may be to lean back and make steeple-fingered proclamations about the history of linguistics, what does all of this have to do with Snapchat? Language and other communication technologies tend to change over time to become more and more nuanced. Messaging is no different. Human conversations are about much more than just static text, so it’s natural that messaging apps would evolve to add more color. We have always gravitated towards technologies that allow us a higher dynamic range of expressiveness. The telegraph was better than semaphore. Talkies were better than silent movies. Television was better than radio. Email was better than snail mail. And messaging apps are quickly replacing SMS. Information wants to be immediate, global, and expressive. Like a stream of water finds a crack in the rock and expands it, information will always find a way to develop a more efficient channel. Just a couple of years ago we were sending clipped, plain text SMS messages back and forth. But today it’s common for a chat to consist of text, emojis, stickers, photos, videos, and audio recordings. Our digital conversations have almost imperceptibly morphed into a rich, evocative form of communication. What’s even more interesting is that just like language changing over time, these ideas seem to be emergent. Hashtags, reaction gifs, and ¯\_(ツ)_/¯ don’t have owners. They appear and spread like cultural memes, and only then do some, eventually, become encoded in products as trending topics, Snapchats, and emoji. And there’s no reason to expect the changes to stop. As was the case with emoji, the next step in the evolution of messaging seems to be coming from the East in the form of apps like WeChat and Line. These apps embed functionality into conversations, allowing users to call a cab or order flowers right inside their messaging UIs. Tasks like this would have traditionally fallen to apps, most of which were shoved into some dusty folder in the corner of your phone for that one time a year you actually needed to launch it. But what if you could achieve the same thing in a conversation? View larger imageToday we achieve these interactions with apps that need to be discovered, downloaded, updated, launched, and used at just the right time. It’s entirely possible that this clutter of apps will be replaced by shifting all of these interactions into a messaging environment that’s already being used every day. If this sounds familiar, it’s because a version of it has been predicted for a while: it’s the notion of functionality lifting itself out of app silos and being made available as services. Up until now the smart money was on these pieces of micro-content and micro-functionality surfacing as cards, perhaps on the web or in the notification layer of your phone. But more and more, notifications are suffering from an overwhelming noise problem that still hasn’t been solved, and with wearables becoming a thing, it may get worse before it gets better. In fact the real shift happening in user habits today isn’t away from the web, or towards a specific replacement device. The change has been to move from one screen to a constellation of screens, regardless of whether it’s a desktop, laptop, tablet, phone, watch, or whatever pops up next. That’s why an app-based channel for cards may make even more sense than an OS-specific one like notifications. No longer tied to a specific platform or device, your conversations and the features they enable can move around with you. The building blocks for so much of this are already in place. Siri and Google Now have been softening people up to the idea of getting structured answers from a non-human. On-demand Services like Uber, Taskrabbit, and Instacart are providing more and more discreet chunks of value that are independent of their app housing. Startups like x.ai are exploring the use of AI-driven messaging to solve bounded problems reliably in automated text replies. 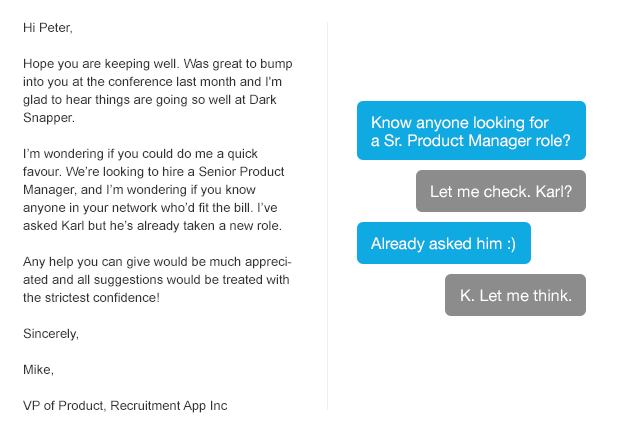 Messaging platforms like Intercom exist to allow businesses to talk to their customers. The quick interactions and nuggets of information that work best on wearables fit right into this new model. Cards may not be the future of the web, but the future of messages. A lingering question: shouldn’t all of this be happening in the notification panel of our phones instead of within random messaging apps? It certainly seems plausible that this might happen at the OS level. In fact, it would be great, and given enough time I think it would indeed happen. But I suspect rich cards will become a de facto standard in a range of messaging platforms long before Apple and Google get around to baking something like this into iOS or Android notifications. Messaging apps are simply able to move and innovate much faster than the OS layer. To explain what I mean, let’s look back again at the sudden and dramatic shift in user activity from SMS to app-based messaging. A few years ago, SMS was beginning to evolve slowly towards capabilities like photos and video (in the form of MMS). But SMS is standardised and tied to complex carrier infrastructure. Perhaps it’s even held back by parties with a vested interest in keeping their lucrative profits undisturbed. This inertia paved the way for over-the-top (OTT) messaging apps to emerge and then innovate like crazy, trying out a whole set of new features that quickly attracted users in their hundreds of millions. OTT apps were faster, better, cheaper. The fact that these apps are built on top of the cellular infrastructure provided is a classic judo move, a more agile layer being able to outmaneuver the slower competition. 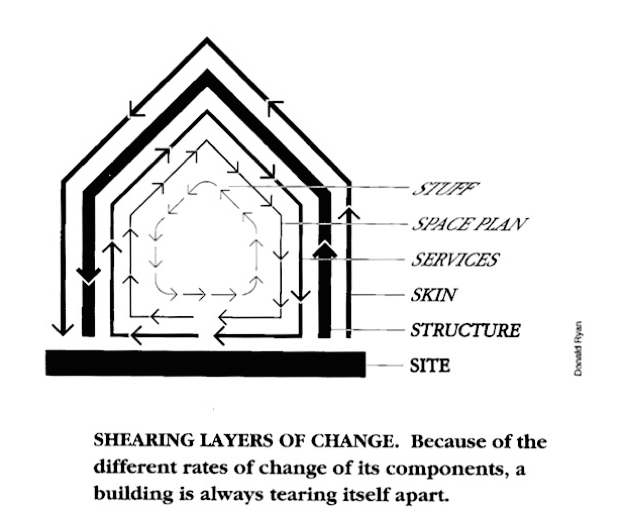 In his book How Buildings Learn, Steward Brand proposes a model for architecture that thinks about the different “layers” of a building changing at different speeds over time. For example, the site on which a house is constructed generally doesn’t change at all, and the structure of the house can remain the same for decades. Inside the house, though, there are more fluid layers that can be easily and quickly changed at will: the stuff is in a constant state of flux, changing every day, or the space plan can be rearranged easily. Brand says that good architecture accounts for the fact that the usage of a building will change over time, and it should be designed to accommodate that change. Carriers are ultimately in the infrastructure business, building a global physical network. They are the site upon which our connected devices are built, and are slow to change. 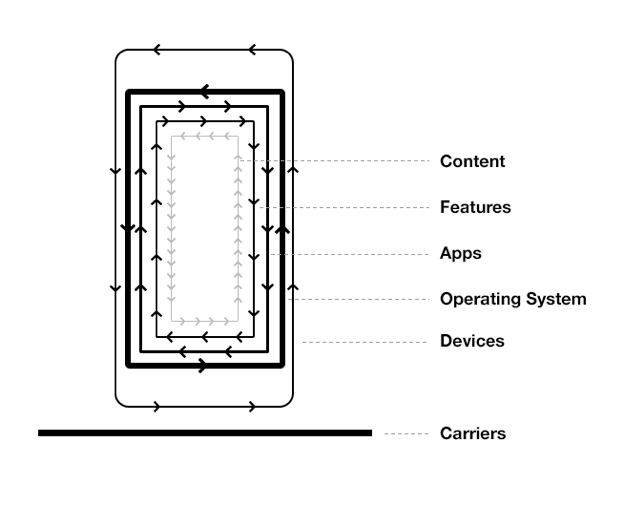 Devices are subject to lengthy design and manufacturing lead time. They might change every couple of years, and in a fragmented way. Innovations that rely on hardware updates can be take years to arrive. Operating systems tend to be updated on a yearly cadence. Not bad, but still not fast enough to match the breakneck speed at which new services and trends appear. iOS still lacks a decent notification system. Apps can sometimes be built and launched in a matter of weeks, which means that new solutions can quickly emerge and compete in an ever-changing marketplace of ideas. Meerkat and Periscope launch and a whole new category is suddenly established. Features can arrive even more more quickly, subject only to app store review times. Every few days an exciting new update can move the state of the art forward. Content is fluid and ever-changing through constant daily use. Innovation comes most quickly here, with people bending existing apps to achieve new goals (e.g. selling goods on Instagram) which in turn suggests a whole new host of features and apps that may be possible. The interplay between new apps, their evolving features, and the content they contain: these are the overlapping layers that move freely enough to allow for rapid innovation. SMS wasn’t able to evolve quickly enough to suit the complex and changing needs of users, because it was too far down the stack, tied to a slow-moving layer. Native notifications are likewise part of the OS, also a relatively slow-moving layer. On the other hand, messages in apps are part of the software features layer, a fluid substrate that can move and adapt much more quickly. Just as messaging apps were able to adopt the carrier’s own cellular infrastructure to deliver a better solution than native messaging, they may be able to co-opt the operating system’s notification system to deliver better real time functionality. Notifications clearly need to get smarter and richer. But as it went with SMS, so it may with notifications: an OTT solution moving much more quickly and eating its lunch. Messaging is about to get a lot more expressive. The conversation is moving forward fast. Exciting times ahead for both users and designers.